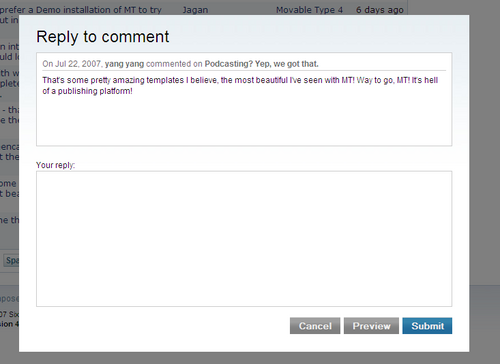 Movable Type 4 contains a new feature which allows you to reply to a comment from within Movable Type’s Manage Comments screen. This streamlines the workflow for an author or site administrator of communicating with a blog’s readers, since now you can manage (publish, unpublish, mark as spam, etc.) comments and reply to comments from a single location. Place your mouse over the row of the comment you wish to reply to. When you hover over the row, the system will place a “Reply” link next to the comment title in the listing screen. Previewing will fail if you don’t have a Comment Detail template. This template is created by default, but be careful not to rename if you modify it. If you don’t have a Comment Detail template, or have deleted it, create a new template under Template Modules (named, of course, “Comment Detail”). Default code for this template can be found here. If this still doesn’t solve the problem, try “Refreshing” the template (this will revert the template to the default code for your current MT version). If you don’t have a “Refresh Template” option (under “More Actions…” when viewing your templates), you’ll need to enable the Template Refresh plugin under your system-wide plugin settings.